It is a requirement in most states for anyone who owns a vehicle to have at least liability insurance on their vehicle. Many people work to get around this requirement. In many cases, people will purchase insurance for their vehicle and maintain it long enough to have their vehicle legally registered. Once this is done, they will cancel the insurance policy. In a bad economy, the number of people driving without insurance increases significantly. A study conducted by the Insurance Research Council shows that approximately one out of every seven drivers on the road does not have insurance on their vehicle. On a national scale, this represents 14 percent of drivers operating vehicles without insurance. The state with the highest number of uninsured drivers is Mississippi and next is Tennessee and then Florida. The states with the lowest rate of uninsured drivers are New York, Maine, and Massachusetts. There are things a driver can do to minimize their financial losses after being in an accident with an uninsured or underinsured driver. It is possible to purchase insurance coverage designed to protect against accidents with an uninsured or underinsured driver. This insurance will provide protection if a driver is in an accident with someone who has no insurance or too little insurance. It can also protect against a driver who is a hit-and-run driver and leaves the scene of an accident. 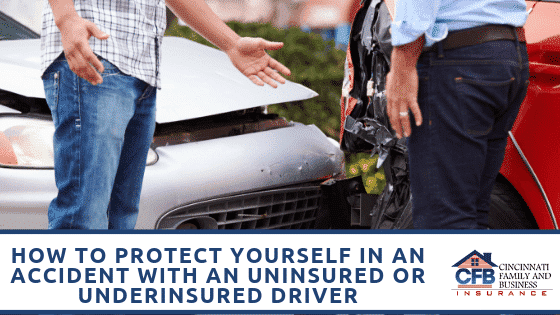 When a vehicle owner purchases uninsured coverage, it will cover the driver as well as relatives residing in the driver’s home. It will also apply to passengers in their vehicle at the time of an accident. It will provide compensation for any of these individuals who are injured when in an accident with an uninsured driver as well as a hit and run driver. Underinsured motorist coverage will cover the driver as well as relatives residing in the driver’s home. It will also apply to passengers in their vehicle at the time of an accident. This provides protection against being in an accident with a driver who does not have sufficient coverage to pay an accident claim. Uninsured and underinsured coverage will not pay for any property damage caused by the accident. When a person is in an accident with an uninsured or underinsured driver, it is possible to sue them for losses resulting from a vehicle accident. The only way this is effective is if the driver who is uninsured or underinsured has enough personal assets to reimburse an accident victim’s for their loss. In most situations, a driver who is uninsured or underinsured won’t have financial assets sufficient to compensate an accident victim. This means litigation may not be a viable way to obtain compensation for losses from this type of vehicle accident. It is important for people to realize that uninsured and underinsured coverage won’t be more than the amount of a person’s primary coverage. Should someone have $150,000 in coverage for any vehicle accident they may cause, then their uninsured and underinsured coverage cannot exceed $150,000. With most vehicle insurance policies, this coverage is reasonable when compared to minimum liability coverage. It is better than dealing with not having coverage. When a person is in an accident with someone who is uninsured or underinsured, they should contact their insurance company as soon as possible. It’s important to let them know they intend to file a claim. Many insurance companies have strict deadlines when it comes to filing an uninsured or underinsured claim. Often insurance companies require a claim to be submitted within 30 days after the accident. It’s important to tell the insurance company the other driver did not have insurance or refused to provide their insurance information. These claims usually require a little longer to settle. An uninsured and underinsured insurance claim will follow the same process as any other vehicle accident claims. In this case, it will be the accident victim’s insurance company that will pay the claim. There will be an investigation, review of various records, police reports, depositions of witnesses as well as a review of medical records and more. It will often provide compensation in situations where there would not be any type of payment without this coverage.